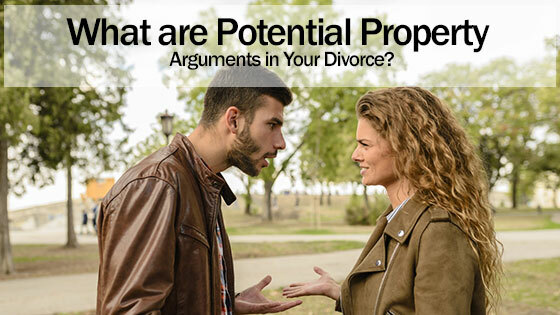 Home » Blog » What are Potential Property Arguments in Your Divorce? A Texas Divorce Attorney Explains. There are a lot of things that have to be taken into consideration when dividing debts and property during a divorce proceeding in Texas. The state of Texas is a community property state. This means that any property that is purchased or acquired during the marriage belongs to both parties. It also allows people to keep the property that they had prior to getting married. An experienced Texas divorce attorney can assist you in navigating the complexities of a divorce. You will have to provide documentation that proves that you owned the property prior to the marriage. If the property’s value has increased during the marriage, then you will also need to provide proof of that. The state of Texas requires that the property be divided up in a manner that is just and right. This means that the property division must be equitable. In order to determine which is separate property, the parties will need to provide a value or balance of the property on the date of the marriage. Dividing up property is even harder when property value increases or decreases during the marriage. For example, you purchased a house before the marriage. When you got married, the home decreased in value. However, it increased in value right before you got divorced. The court may decide to rule in your favor. These types of confusing details are made clear with the knowledge of an experienced divorce attorney. It is important to note that equitable is not the same thing as equal. Equitable means fair whereas equal implies a 50/50 split. That is why the property may not be divided up in a 50/50 way. There are a several arguments that can be used to divide the property up in a way that is not 50/50. For example, the court will consider what each person contributed during the marriage. Many people will assume that a person will automatically get more just because they worked and their spouse stayed home, but that is not true. This is not an argument that the court will utilize in making its decision. It is important to focus on how much the separate property contributed to the marital estate. You can also talk about the upkeep and care of the property. The court does not like to see people talking badly about their ex-spouse. However, you can talk about the roles that each of you played in the marriage without speaking too negatively. If you want to talk about the separate property contributions in the marriage, then you will need to provide the proper documentation. This includes things such as documents that show the transfer of the funds to the estate or probate paperwork. If both parties worked, then contribution arguments can also be used. In some cases, both parties work, but only one person helps the marital estate and assets grow. Contribution is just one of the many factors that the court will factor in before they decide who will get what. The court will have to review the economic circumstances of both of the parties. They will also take the health and age of both of the parties into consideration. Property division is one of the many things that can make a divorce difficult. An experienced divorce attorney can assist you in making this process as smooth as possible. You can call our offices today if you would like to speak to a divorce attorney for a free consultation. You can reach us at one of the following numbers. What are the Issues a Business Owner Should Know When Going Through a Divorce? A Texas Divorce Attorney Helps Explain.